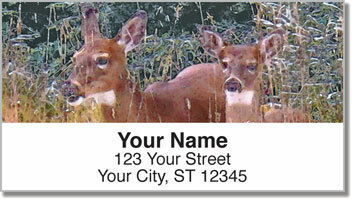 Nature photography featuring a doe and her fawn in a field of tall golden grass make a peaceful wildlife address label design. Deer are creatures of grace and serenity, which is quite evident in these beautiful shots. We've added some artistic embellishments to give all four images the soft look and warm feel of a watercolor painting. What an outstanding way to decorate your typically dull outgoing mail. 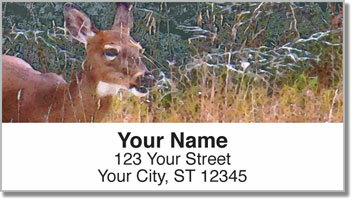 Watercolor Deer Address Labels are a CheckAdvantage exclusive that can be just as convenient as they are attractive. Use them to save time preparing letters and packages, or stick them on all sorts of personal property to mark it as your own. 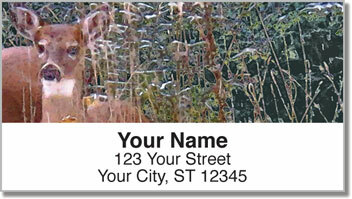 Order Watercolor Deer Address Labels right now! 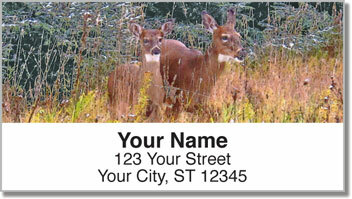 This selection is also available in a set of matching checks.